Translating science to audiences of all ages and cultures is truly a multi-media challenge. Words, images, graphics, hands-on experiences, and dynamic presentations bridge the gap between academia and meaningful insights that spark life-long curiosity. After almost 20 years of managing science education, outreach and interpretative programs, my leadership capabilities in project management range from overseeing contractual services to acting as a community liaison. I am used to wearing a lot of different hats, and wearing them well. I have written interpretive science copy for touch-screen kiosks, interpretive exhibits, trailside signs, newsletters, websites, science research blogs, printed and electronic promotional materials, curriculum, lesson plans, lab activities and marine science field guides. I have a passion for translating science using words, images, and illustrations, whether it be writing copy from scratch, or re-working existing sources. All too often with exhibit design, there are several players with different opinions about how the exhibits should look, and what they should teach to your visitors. Scientists often want to include too much background information, the sponsors want curb appeal, the artist just doesn’t get it and the educators want a take home message. I can facilitate the exhibit design process and boil down your exhibit content to meet essential learning objectives while involving artists, scientists, educators and decision makers. (AT LEFT) Back in the 1990s I helped start up this fishing line recovery and recycling project in Brevard County, Florida. Now it’s everywhere. 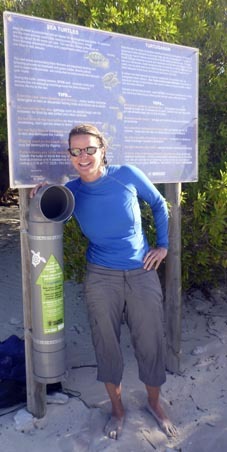 I found this fishing line collection bin on Bonaire in 2012. Management and action plans are all well and good, but without buy-in from the community, these tools are likely to sit on a shelf somewhere collecting dust. Using multi-media outlets and a range of approaches to the community, I can build and implement a strategy to disseminate your information and involve the community. For close to 20 years I have taught students from “K to Gray” – in other words from Kindergarten to Elderhostel. I never back away from a teaching-related challenge, whether it be to instruct college students about reef ecology while using Scuba, or to train other educators to incorporate real-time oceanic data into their curriculum. A global, sustainable future depends on bringing together community and conservation. I can facilitate and manage the process of planning for coastal climate change impacts, habitat and species restoration, coastal zone management, and much more. The need for real local and regional sustainability may well drive all we do in the coming years. If you have a document that needs to be packaged either in print or electronically with a cohesive theme and organizational elements, then I’m your woman. In addition to being adept at graphic design using the Adobe Creative Suite and both Mac and PC standard software packages, I can draw upon thousands of my own images to use in your publications. Your hard work has never looked so good, or been so well organized. Proficient in both PC and Mac environments with regular us of the Adobe Creative Suite, and Microsoft Office Suite including Word, Excel and PowerPoint. I can tap into all the social media sites and have been webmaster and designer of this site, as well as earlier educational webpages. Put me at the helm of a small boat or underwater blowing bubbles and I’m as happy as a clam. I have built upon a lifetime of experience on the water to hone my skills as a captain and divemaster. I bring years of knowledge to your team when it comes to working on the water, handling lines, or skippering tenders — let me at it!